Working alongside Mike is his longtime friend and fellow traveler, drummer Michael Murray, who undertook engineer duties with the recording of “Travelog,” Polish-born bassist extraordinaire Mark Tupko, vocalist Saint John Coleman, and their newest member, Los Angeles-based Peter Matuchniak (who replaced a great player in Todd Russell who left the band after Progtoberfest in 2017). Peter brings with him a world of prog experience, having been with the Gekko Project, The Steppes, and his latest project Bomber Goggles, and some name recognition that can only help the band’s profile. His playing has given KE a change in style but the overall sound is still clearly that of KE. “The Face of Life” gets its guitar parts via file sharing, but they are so organically composed and played that they sound as if they are all in the same room. Mike, of course,has been the heart and soul of this project for thirteen years and Michael has been with him for twelve of those. Mark came on board early in 2014, Saint John in 2016 after the festivals, and Peter has really rounded them out sonically and with another talent for the recording process. Saint John’s presence gives the band their first true full time lead vocalist. He had been playing with prog cover band DEJA in the Tidewater region of Virginia, and he says coming to KE has given him back his musical soul. Kinetic Element’s two principal writers, keyboardist and founder Mike Visaggio and guitarist Todd Russell, began collaborating on new music for the band towards the end of 2013 following the departure of two members. Deprived of the ability to play out, they decided to focus on composing and recording KE’s second CD. They began working out sketches to five grand scale pieces of prog rock with founding member and drummer Michael Murray. Soon they had a working model of the album and began recording in earnest. Kinetic Element was formed to perform the music of Mike Visaggio’s solo CD, “Starship Universe” which was released in 2006 after Mike was selected to perform at the 2006 Pop Montreal festival. They are now performing selected classic prog and classic rock covers and their new prog pieces they have put together since they formed which comprise “Powered By Light” (2009) and their new CD “Travelog”. The cover art for both CDs was executed by the incomparable Martin Kornick. “Powered By Light” was nominated for Best Debut CD of 2009 by The Prog Awards, which was at that time an Italian reviews website. They were signed to Melodic Revolution Records at ROSfest 2013. The band is comprised of Mike Visaggio (keyboards); Michael Murray (drums), Todd Russell (electric and acoustic guitar) and Mark Tupko (basses). In May 2008 the original incarnation of Kinetic Element was privileged to be a support act for Circa (featuring Tony Kaye, Alan White and Billy Sherwood of Yes, at Jaxx in northern Virginia), Rare Blend (at Orion Studios in Baltimore, Maryland one of prog’s must-play venues), IZZ (who have played every prog festival in America, at the Artomatic festival in Washington, D.C.) In 2009, KE’s Powered by Light lineup supported Morglbl (at Capitol Ale House Music Hall in Richmond VA) and in 2010, with Edensong (at Orion again). Kinetic Element opened the nation’s longest running prog rock festival, Prog Day, at the Pre-Show on August 29, 2008 with Speechless and again on Sept. 3, 2010 with Jack Dupon. They played The Magic Room in Boston in November 2011 headlining, with support acts Eccentric Orbit and Resistor. In 2015 KE has headlined at Orion Studios again (May 29) with support band Brave, and supported Lo-Fi Resistance at New Jersey Proghouse (June 6). Kinetic Element was featured in Progression Magazine #59 in 2010. 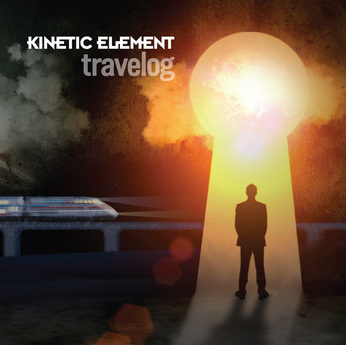 Kinetic Element’s new album “Travelog” was recorded by the band at their cavernous garage studio in Richmond VA with Michael Murray performing engineer duties, between December 2013 and February 2015. In May of 2014 bassist mark Tupko auditioned and joined as the band’s fourth permanent member. Unable to find a suitable vocalist in their hometown, Mike Visaggio reached out to their musical friends Odin’s Court whose lead vocalist Dimetrius LaFavors agreed to perform the vocals for Travelog and join the group while remaining with Odin’s Court. However Dimetrius could not continue due to changes in Odin’s Court’s schedule, and was forced to cease recording after appearing on three of the five tracks. Riding in to KE’s rescue came Michelle Schrotz of Fredericksburg, VA’s prog icons Brave, and stellar CProg artist Mike Florio, to record the remaining two tracks. Early in the spring 2015, Kinetic Element was offered a show at New Jersey Proghouse for June 6, and all the production went into high gear in order to have product in hand for that show and another one that was booked for a week previous on May 29 at Orion Studios in Baltimore. Both shows came off well with Mike Florio and Michelle singing. However there are no shows on tap at this time because their vocalists do not live in Richmond, but are available if a suitable concert gig comes KE’s way.